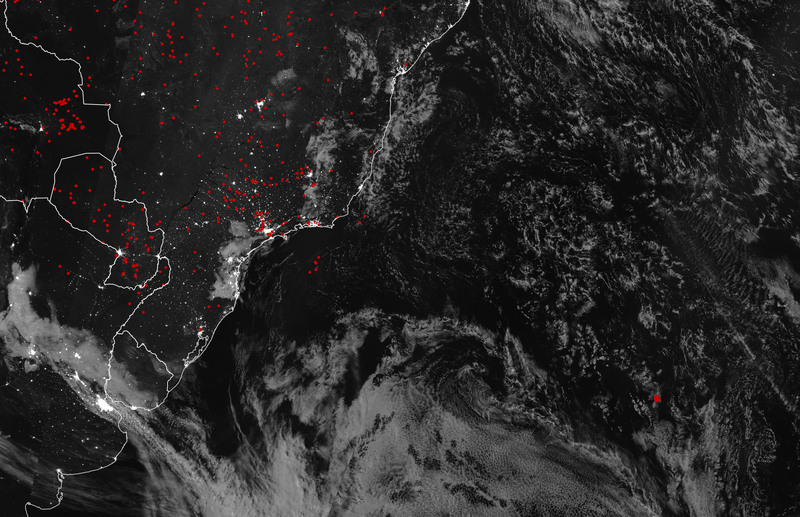 On July 14, 2017, the Visible Infrared Imaging Radiometer Suite (VIIRS) on the Suomi NPP satellite captured this night image of the South Atlantic. The red dot several hundred kilometers off the coast of Brazil is a thermal anomaly—an area of Earth’s surface flagged by the satellite as being unusually warm. Of the thousands of thermal anomalies that VIIRS detects each night, the vast majority are caused by fires. “But obviously a fire isn’t burning in the middle of the ocean,” said Patricia Oliva, a scientist at Universidad Mayor who helped develop a fire detection algorithm for VIIRS when she was at the University of Maryland. 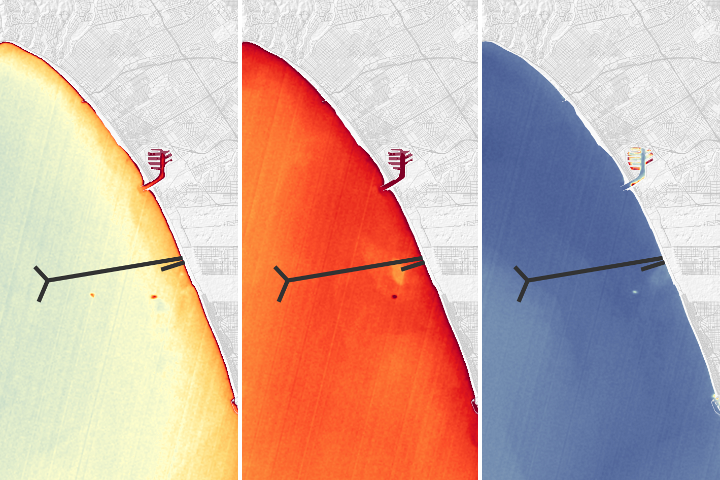 Natural gas flares also trigger thermal anomalies, but they are only found in shallow waters near the coast. 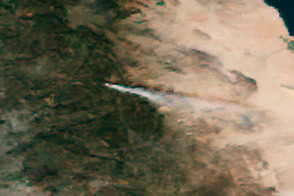 Volcanic activity can light up the satellite as well, but there are no volcanoes anywhere near this area. “It is almost certainly SAMA,” Oliva said, using an acronym for the South Atlantic Magnetic Anomaly. This weakness in Earth’s magnetic field, centered over South America and the South Atlantic, allows one of Earth’s Van Allen radiation belts—zones of energetic particles trapped by the magnetic field—to dip closer to the atmosphere. As a result, much of South America and part of the South Atlantic Ocean get an extra dose of radiation. While the atmosphere blocks most high-energy particles, and they do not cause problems at the surface, there are enough of them in the space close to Earth to cause issues for the electronics systems of spacecraft. The International Space Station has extra shielding because of SAMA, and the Hubble Space Telescope powers down its science instruments when it passes through the region. 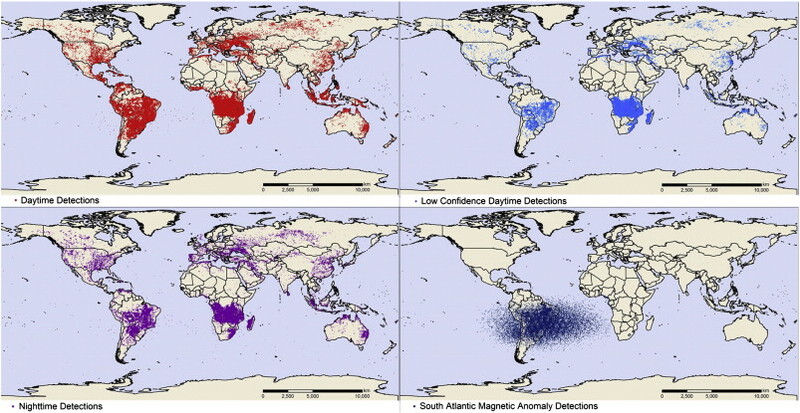 In the case of VIIRS, there are enough energetic particles zipping around in the atmosphere around South America that the highly-sensitive radiometer detects some of them. 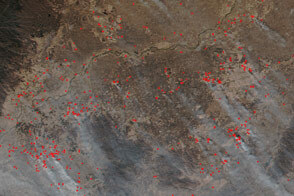 In fact, the team developing the VIIRS active fire data product was surprised at how often the particles showed up as fires when they first began to process the data. 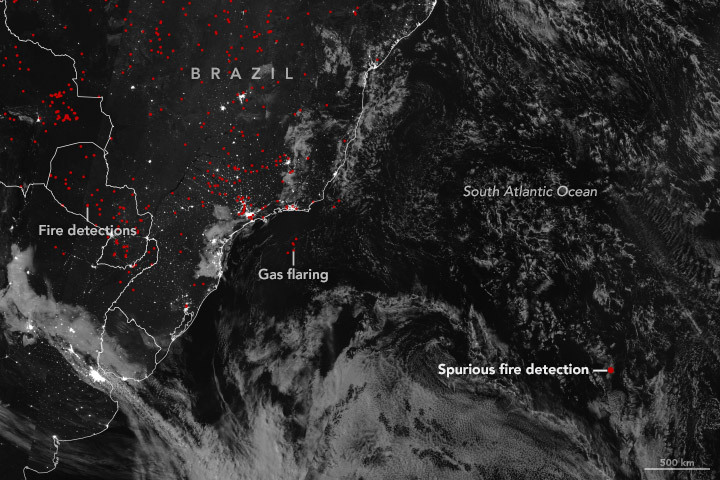 “Each night, the sensor was detecting several dozen thermal anomalies over the Atlantic Ocean in places that didn’t make sense,” said Wilfrid Schroeder, the principal investigator for the VIIRS active fire product. The scientists were aware of this type of anomaly because researchers working with NASA’s MODIS sensor and the European Space Agency’s Advanced Along Track Scanning Radiometer (ATSR) satellite had encountered it. 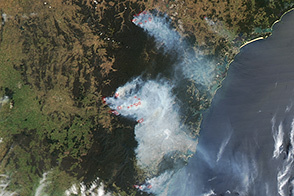 But the VIIRS team did not anticipate picking up on so many spurious fire signals. 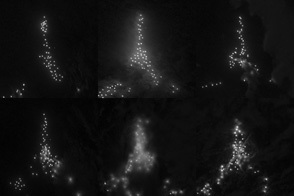 Their response was to build a series of filters into their active fire algorithm and remove false signals in this region. Suspicious thermal anomalies that are especially weak, over the ocean, and short-lived—all signs that they were caused by SAMA instead of a real fire—get removed by the algorithm. NASA Earth Observatory image by Lauren Dauphin, using VIIRS day-night band data from the Suomi National Polar-orbiting Partnership. Story by Adam Voiland. Anderson, P.C. et al. (2018) Mapping the South Atlantic Anomaly continuously over 27 years. Journal of Atmospheric and Solar-Terrestrial Physics, 177, 237-246. Casadio, S. & Arino, O. et al. (2011) Monitoring the South Atlantic Anomaly using ATSR instrument series. Advances in Space Research, 48 (6), 1056-1066. NASA Earth Data FIRMS FAQ. Accessed October 25, 2018. NASA Earth Data The South Atlantic Anomaly. Accessed October 25, 2018. 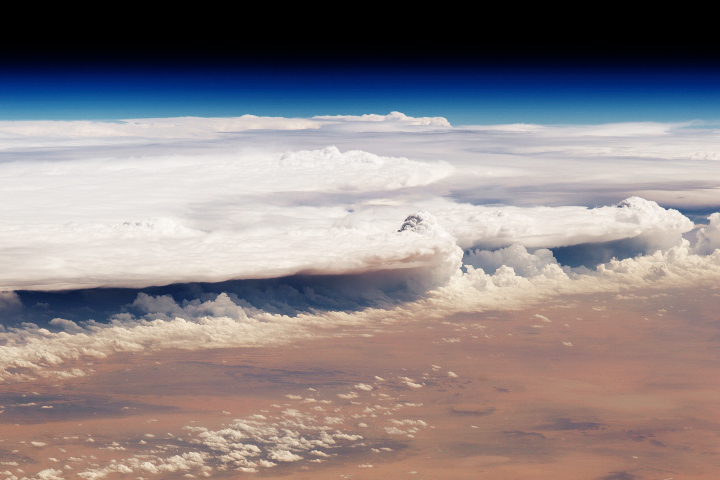 NASA Earth Data VIIRS User Guide. Accessed October 25, 2018. Schroeder, W. et al. (2014) The New VIIRS 375m active fire detection data product: Algorithm description and initial assessment. Remote Sensing of Environment, 143, 85-96.